Daniel’s Grandma is celebrating her 87th birthday today. Happy Birthday! We did a small little dinner and cake to celebrate yesterday with the family and I whipped up one of my go to pop up cards. 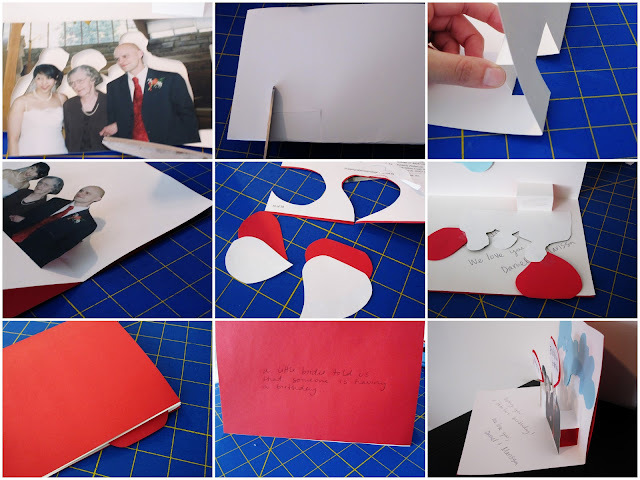 They are so easy and quick to make that I thought I’d share the how to’s with all of you in case you wanted something fun for Valentine’s day or just the next time you need a card. Cut your picture out. I’ve used pictures, drawings, and words the possibilities are endless. Fold your inside paper in half. Decide where you want your picture to go. Lay it out and snip two lines making sure they hit about the center of your picture. Make sure to use a part of the picture where you can stick the ‘pop up part’ to without the paper showing. Fold the cut part to the inside of the card. Now do you kinda see how it works? 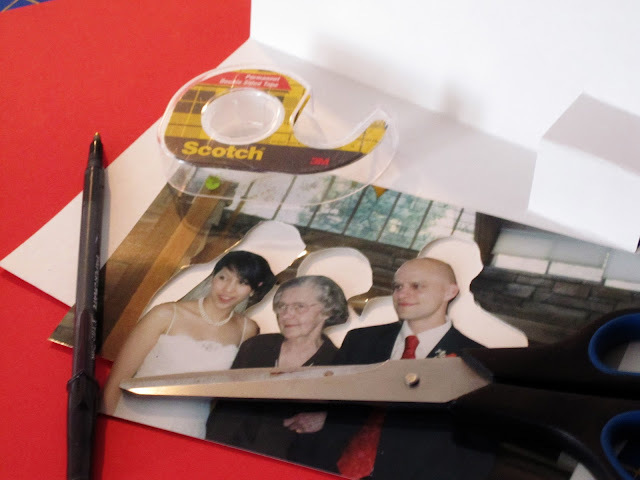 Tape the outside paper to the backside of the inside paper with the pop fold to the inside. Add any other details you may want (I went for clouds). Decorate the outside. I’m usually leaving things to the last minute so it’s often just something written for me but doing a whole fancy card would definitely be a plus. Write your message on the inside and you’re ready to give. Hope you like it. Let me know if you try it out. Very cute! I love the look of your blog. Did you make the changes yourself? What a great (and versatile)idea! Cuuuute. 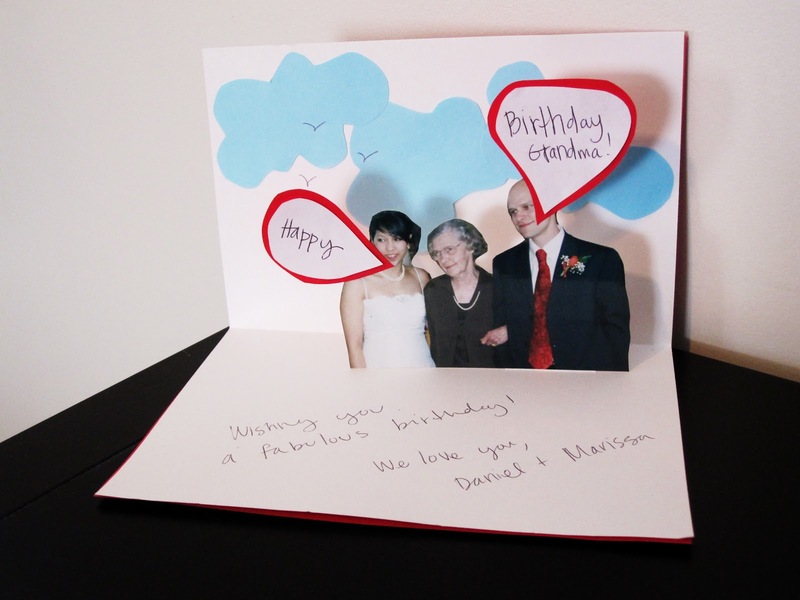 Love this idea for homemade cards. Joined the party over at “To Sew With Love” and saw your link there…Love your style! 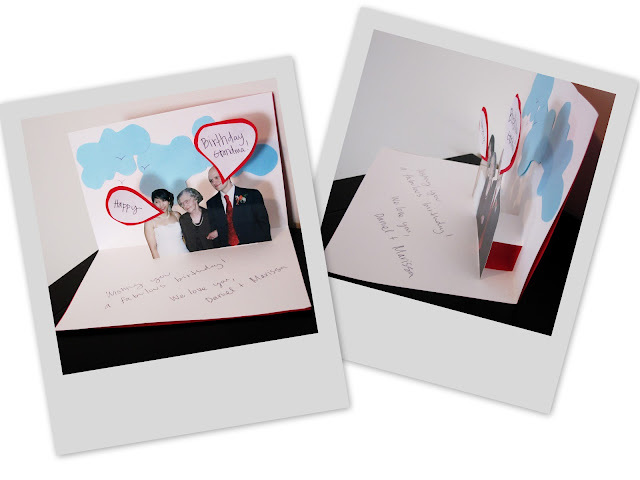 What a wonderful way to make a personalized pop-up card. Great tutorial. I’m going to have to snap a few pics of my girls and make some cards in advance, so I’m not caught empty-handed for birthdays this year! Oh, I love it! I always liked pop up books as a kid. Thanks for linking up to Gettin’ Krafty With It! I love pop up cards! I need some quick valentines this year & this is perfect! That’s cute. I love making pop up cards! wow! lovely card! thanks for linking up at our crafty saturday party! we are featuring your project tomorrow! can’t wait what you have for next week! Great card! My little one would LOVE to do this! THIS IS AWESOME!!! I’m featuring you this week on Talent Tuesday!